Acid Nasty Maduro is a strong and savory little smoke. It features the signature spiciness of the Acid Red line with some added sweet chocolate and coffee notes from the Maduro wrapper. The Nasty’s unique and eye-catching tapered shape gives the cigar fantastic burn and draw performance for optimal delivery of its potent flavor profile. Acid Nasty Maduro is a boldly-infused member of the Acid Red line with strong notes of earth, dark chocolate, and floral undertones in a 4 x 52 Short Robusto vitola. 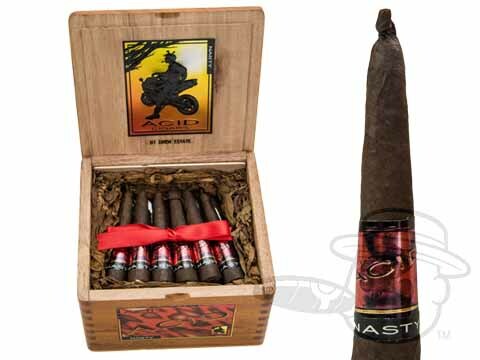 Maximize your savings on Acid Nasty Maduro with this special 2 Box Deal! I got this cigar in the ACID sampler. I'm a little confused by the other reviewers statement that it's a 1 hour smoke. Hmmmm I timed it and it was just about 20 minutes. Maybe he lost track of time? Maybe I smoke fast? Who knows but I did watch the clock. I didn't care for the flavor of the NASTY. It seemed bitter and had an unpleasant after taste. It didn't seem to have the complex flavors I've experienced with other ACID cigars. It's a small cigar and pretty good for a smoke while driving home from work. The burn was even and the ash was dense. The best Acid I've tried. Love the 1 hour smoke, easy draw, and even burn. Got it as a lark and scored a win. I read others reviews and to be honest, this is exactly how I imagined an acid maduro to be. If you've tried an Acid and wished it to have more spice or kick... try it. Sorry to all who have liked this cigar. I’m not trying to be an “Acid hole” concerning my dislike for this cigar. Obviously they are not for everyone and I’m one of them. I got this cigar as part of a sampler. I never had any interest in buying them other than in a sampler. To me it was solely appearance. They could have called it The Ugly. Having smoked it I can understand why they called it Nasty. To me it was. I am a true Acid fan for sure and have tried most of them. I am more into the Kuba Kuba and Blondie flavors. I also like the Cold Infusion a lot. This Ugly Nasty has too much of a bite for me. You can taste some of the complex flavors that make Acid cigars stand out but those flavors are hidden behind flavors that aren’t pleasing to me. The do have an impressive burn time for being so nubby. So there’s my thoughts on the Ugly Nasty Nubby. I have no doubt they have many loyal fans. They are Acid after all. Acid Nasty Maduro is rated 4.1 out of 5 based on 5 customer ratings.